The zombie attacks aren’t left to just the American south. China has decided to jump on the enraged-person-eats-face bandwagon. Drunk Chinese bus driver, Dong, blocked the path of motorist Du. Du steps out. Dong attacks and eats Du’s face. Sometimes the headlines, they write themselves. According to local Chinese news reports, the bus driver, Dong, had been drinking heavily with his friends before the attack. He ran into the road in the city of Wenzhou, south-east China, and stood in front of the car being driven by a woman named Du. Dong climbed on the car’s hood and started beating the vehicle while the panicked woman screamed for help. When she exited the car, the bus driver leaped upon her, pinning her to the ground and eating her face. Witnesses say the driver had gone crazy, and was resisting attempts to subdue and remove him. It should be known that Jiang Shi is a creature of legend, known as a hopping zombie. It leaps from its coffin or caves and dark places at night, arms outstretched, to kill and absorb the qi of living people. 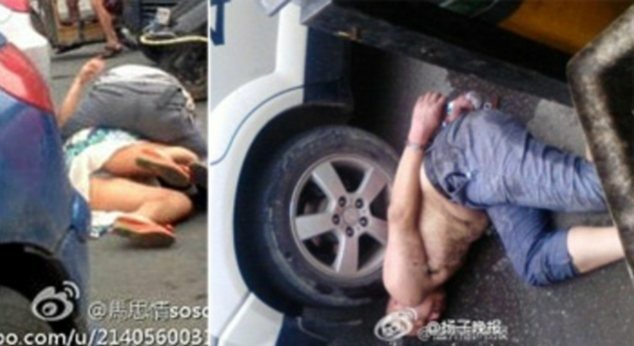 The post Chinese Zombie Attack: Drunken man leaps upon, eats woman’s face first appeared at The Undead Report.